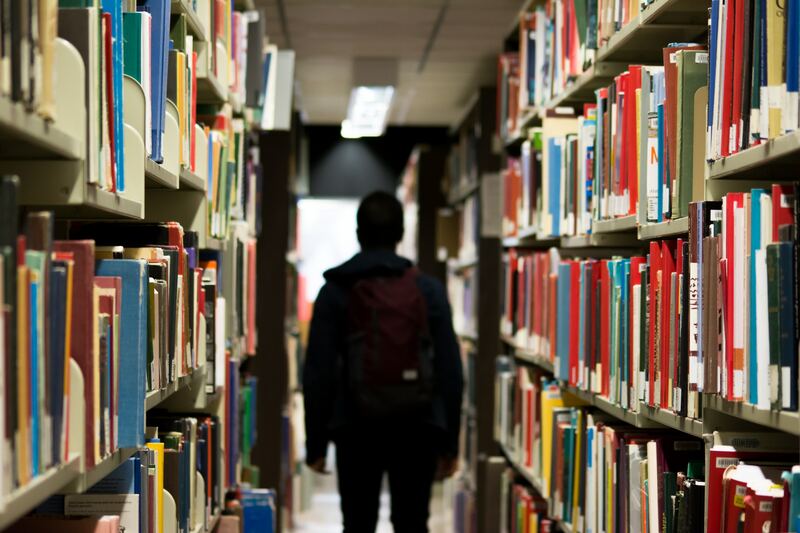 If you want to improve university enrollment rates among Maori and Pasifika kids, you should look at what’s going on earlier in the education system. Lisa Meehan, Gail Pacheco and Zoe Pushon find that ethnic gaps in school performance are the largest contributors to ethnic gaps in university enrollment rates. Those gaps matter far more than differences in socioeconomic status or parental education. They use administrative data held in the Integrated Data Infrastructure to control for meshblock-level deprivation index scores rather than school decile rankings, providing a finer grained measure of background characteristics. They also have parent’s highest degree from the 2013 Census, student ethnicity, school characteristics, migrant status, and distance to the nearest bachelor-granting institution. Table 4, copied below, provides a decomposition of the relative contributions of the different variables. 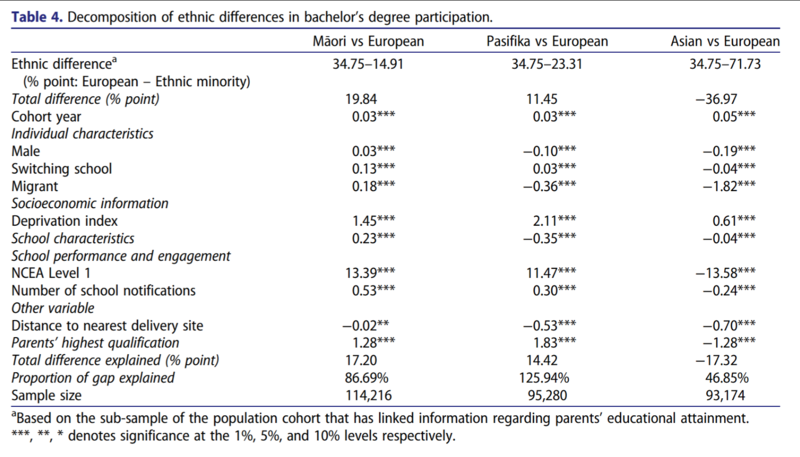 So the total difference in bachelor’s level enrollment between Maori and European is 19.84 percentage points. 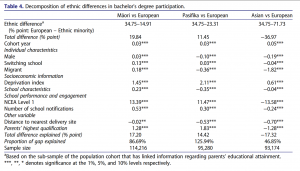 If Maori students had the same characteristics as European students on things like frequency of switching schools, migrant origins, neighbourhood deprivation index, school characteristics, NCEA Level 1 performance, number of school notifications and parents’ education, that gap would drop to 2.64 percentage points. Providing Maori students with the same NCEA Level One results as European students would increase their enrollment rates by 13.39 percentage points. Everything else is rats and mice. Swapping Maori students’ neighbourhood deprivation index figures with Europeans’ would increase Maori enrollment by 1.45 percentage points. When they disaggregate school performance, most of the work’s being done by the number of merit and excellence credits; it would be interesting to have further work comparing differences across types of credits – an excellence in calculus might be different than an excellence in gym. The big upshot: neighbourhood background characteristics are important in explaining ethnic gaps in student progression to Bachelor’s level study, but how students perform at NCEA Level 1 is what matters most. You could argue for a multilevel model where deprivation characteristics work through two channels and also affect NCEA Level 1 performance. But all of it suggests that if you want to increase enrollment in Bachelor’s level study among Maori and Pasifika students, you shouldn’t be looking at zero-fee first year university policies. You should instead be working to improve performance at secondary school. And that’s exactly what I’d argued in our report a couple years ago on the zero percent student loans programme. I there argued that the $600 million per year that’s blown on subsidies through the zero percent loans scheme should instead be directed to means-tested funding for tertiary students in need, and toward better preparation for tertiary study in high schools with poor track records in advancing kids through to tertiary study. Instead, the government’s looking to compound the problem of zero percent loans with a fees-free policy for first-year study. The inevitable critique is “Why not do both! Fees-free study and big increases in secondary school funding!” But the government is trying to work within a budget constraint that binds. Everything has an opportunity cost. Overall, our results suggest that ethnic-based policies aimed at encouraging entrance to bachelor’s degrees are likely to have a limited effect if used in isolation. Rather, our findings highlight the need for policy intervention earlier in the education system to help lift the NCEA performance of Māori and Pasifika, and in doing so improve the likelihood of their participation in higher education qualifications, such as bachelor’s degrees. * Now, imagine a world in which it were not illegal for Meehan et al to simply array schools by their fixed effect and to announce the league table. Stats NZ won’t allow it because anything individually identifying, including things that identify individual schools, is forbidden. But imagine. Wouldn’t it be interesting to know, correcting for everything else about the kids, which schools have the best track record in progressing students through to Bachelor’s level study?